We all hold a certain vibrational frequency, not to mention our bodies are estimated to be about 70% water… so we can probably expect that musical frequencies can alter our own vibrational state. Every expression through sound, emotion or thought holds a specific frequency which influences everything around it—much like a single drop of water can create a larger ripple effect in a large body of water. 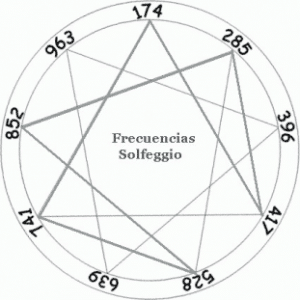 Another interesting factor to consider is that the A=432 Hz tuning correlates with the color spectrum and chakra system while the A=440 Hz isn’t aligned. Article Credits: www.attunedvibrations.com. Used with permission. Here is a video of a Sacred Chant that was recorded inside of the great pyramid forming sacred geometrical patterns on a plate. Cymatics is the study of the effects of sound vibrations on physical matter. This provides the visual evidence that proves the physical power of sound and music. Now, with ‘sound made visible,’ it is possible to demonstrate astonishing effects on solids, liquids and gases.